Cornish MPs have met the Transport Minister Derek Twigg on Wednesday in a bid to retain the overnight sleeper train from Penzance to London. A 3,000-signature petition was also handed in to Downing Street by campaigners, including the ex-governor of the Bank of England, Eddie George. The government claims the train loses £2.5m a year and there are fears the service could be scrapped. But the figures have been disputed by the Save Our Sleeper (SOS) campaign. MPs and business leaders have raised concerns over the sleeper service because the new rail franchise bidding process asks bidders to cost it separately from other services and suggest alternatives to it. 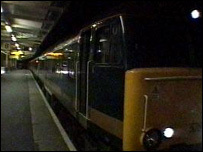 Many are concerned the sleeper service to Paddington could be axed as early as next April. The government has refused to guarantee its survival despite appeals in Commons debates. The Department of Transport has said the train is underused - and on average only a third of the 64 berths are occupied, but SOS also disputes these figures. Spokesman Andrew Roden said: "It can be a nightmare to book a berth, even weeks in advance. "Train staff have told me it is now busier than it has been for many years as a result of our campaign. "There is everything to play for. If we can demonstrate enough support for the train, we will save it." SOS claim the sleeper, known as the "Night Riviera" is vital to the county's economy. They say it is used by people wanting to get flights from London, workers wanting to get to the office before nine and tourists travelling to Cornwall. The Department for Transport will chose the successful bidder and the new Greater Western franchise will start on 1 April 2006.